Once, while the great Periyāḻvār was collecting flowers and Tulasī from his garden, he saw a small baby girl under a Tulasī plant. Periyāḻvār carried this baby home to his wife Vraja. The couple who were till then childless were delighted to receive this divine grace of the Lord and showered their love on this child. They named her "Godā" meaning daughter of mother earth in Sanskrit. The child, who later became known as Āṇḍāḷ, had the great fortune of growing up in this family of great bhaktas and turned out to be a great Krishna bhakta, whose experience is unparalleled in history. Even among the Āḻvārs, Āṇḍāḷ’s grace surpasses that of all the others. The Jñāna and bhakti came to her at a very young age. She became known as an embodiment of love for Śrī Krishna. Āṇḍāḷ also used to pluck flowers and prepare garlands along with her father. Her talks and thoughts were always on Krishna. With the garlands, she used to accompany her father to Vadabhatrasayī temple to have His darśan. 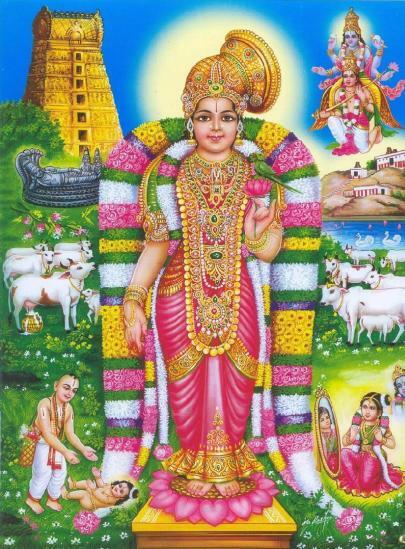 Being a devotee of "Śrī Vadabhatrasayī", the presiding deity of Srivilliputhur, Periyāḻvār would weave a garland of Tulasī leaves daily and keep it sacredly rolled in a flower basket so that he may, after attending to his other duties, take the garland later to the temple for offering to the lord. The child Āṇḍāḷ in her profound innocence started to take out the garland daily without her father's knowledge, adorn herself and look into the mirror dreaming whether she was suitable bride to the lord and then would remove the garland and put it back in the basket in its original form. When Periyāḻvār adorned the Lord with those garlands, that day the Lord looked exquisitely beautiful and there was even a smile on his lips. The garlands were spreading an excellent fragrance throughout the temple and everyone was talking about the speciality of garlands that day. Periyāḻvār did not know why on that day it was so different and special when there was nothing extraordinary he did on that day. It was same flowers; same Tulasī and same way of preparations. Why then all this good smell and beauty? He did not know. This was continuing for days. One day to his surprise, Periyāḻvār saw the child wearing the garland before he could take it to the temple. He was shocked for he considered this as a great defilement. He became terribly angry and depressed; felt very much sad and hurt. Godā was welled with tears with the feeling of guilt and Periyāḻvār’s heart melted seeing his darling child crying. He lightly hugged her and consoled her saying "Don’t do that anymore, Godā! This is meant for the God our Lord! Do not worry... Today I will make another garland. Let it become waste. Don't cry." He made another set of garland and adorned the Lord - but that day there was not usual smell, no beauty and no brightness on His face; nor there any smile on His lips, too. The priests were also confused. Periyāḻvār felt sad that he became angry with his sweet child that day for the first time and the Lord also did not look well with the second set of garlands. "My dearest Periyāḻvār, Viṣṇucitta! For singing verses of glory and wearing my garlands Godā has earned a special place in my heart. She is my beloved Bhūdevī (Mother-Earth) and only appeared as your daughter and she shall be called Āṇḍāḷ hereafter. Do not try to stop her from wearing the garlands. She should continue wearing them." Periyāḻvār woke up and realised the divinity and greatness of Godā. He became greatly excited to know that she is the beloved of the Lord and called her "Āṇḍāḷ". He explained everything to her and Āṇḍāḷ's face became red with shyness and blushed. Āṇḍāḷ wrote Tiruppāvai (30 verses) and Nācciyār Tirumoḷi (143 verses) as a prapatti to the Lord and to seek refuge at His Lotus feet. Later great seers appreciated the depths of this philosophical composition of Āṇḍāḷ. What we see is the intensity with which this effort should be undertaken, and the impatience that the Jīva should feel in achieving this goal at all costs, until the goal is realized. When Periyāḻvār brought marriage discussion to Āṇḍāḷ, she mentioned only Govinda’s name as Her groom. Periyāḻvār knew well of her intentions, since he himself was partly responsible for bringing her up always thinking for Krishna only. He also knew that Śrī Raṅganātha was her heartthrob who stole her heart. He was rightfully worried as to how it is possible to get Godā married to the Almighty. His worry and burden increased day by day as much as Śrī Āṇḍāḷ’s love for the Lord increased. The Lord appeared in Periyāḻvār’s dream and asked him to come to Śrī Rangam the next day. He also appeared in a dream to King Vallabhadeva, the Pandyan ruler at the time and asked him to arrange to bring Āṇḍāḷ and Periyāḻvār to Śrī Rangam with all honours. Next day the King along with his entourage, Srirangam chief priests, the chief officers, ministers, all people of Śrī Villiputtur, thronged at Periyāḻvār’s house. Palanquin, the royal umbrella, flower garlands, temple elephant and Royal elephant were all brought to bring the blessed great father and the daughter. The ladies beautified the already beautiful looking Āṇḍāḷ with flowers, etc. Periyāḻvār and suite brought Godā slowly lovingly and affectionately to the palanquin. They reached Śrī Raṅgam and the temple and were guided straight to the inner shrine of Śrī Raṅganātha. Our Godā stepped into the inner court, looked at Śrī Raṅganātha on the serpent bed and His face and immediately merged and united with the Lord as a Jyothi (the eternal lustrous light).